Bergisch Gladbach – New Zanders Paper GmbH, emerged from Zanders GmbH, will maintain and even further develop the full product portfolio. 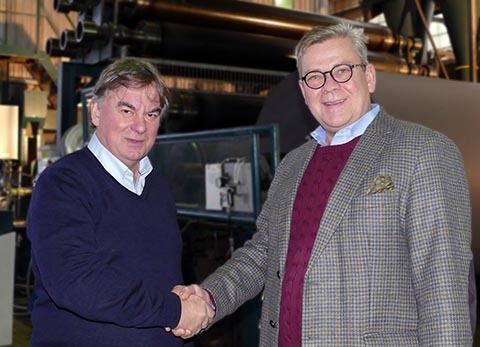 Terje Haglund, head of the Scandinavian investor group that acquired the company as of 1 December 2018: “We are very much looking forward to continuing paper production at this historic industrial site. Zanders will carry on to optimize its cost structures. As a lean and healthy company, it will be well positioned to succeed in the highly competitive paper market. Zanders will continue to service its customers with the full existing product portfolio with a focus on meeting market demands.” Haglund has been active in the paper industry for more than 20 years, among others as Managing Director at Lessebo Paper (Sweden), and recently, together with a group of investors, acquired the paper manufacturer Virginal Paper. Head of Management will be Andreas Willeke, who already headed the company in the past months as Chief Restructuring Officer. He combines proven expertise in restructuring in the industrial sector with important in-depth knowledge of Zanders, its clients and products. Willeke: “We will continue to produce all existing products, from Chromolux paper and board, Zanlabel and Zanpack, Zankraft, Zanflex and Zanbarrier OGR to Silver digital and Zanjet, our successful high-speed inkjet quality. And, in particular, we will further develop the new grades Zanbarrier NGR and Zangrass. This all will ensure sustainability of the business going forward.” The Sales Managers look forward to introducing the new Zanders to all customers shortly. Zanders Paper: Managing Director Terje Haglund and Head of Management Andreas Willeke (on the right). Photo: Tobias Müller for Zanders Paper.